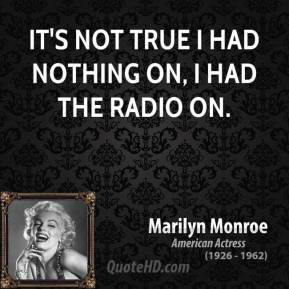 It's not true I had nothing on, I had the radio on. When it comes to the video channels and the programs, the radio stations, the music is geared towards kids, and it's made by kids. 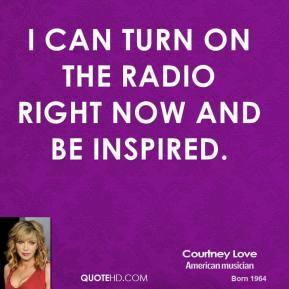 I can turn on the radio right now and be inspired. 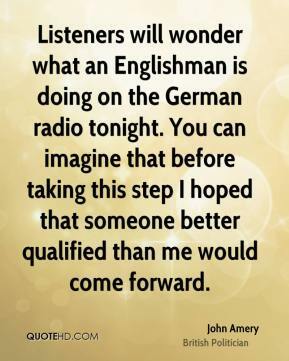 Listeners will wonder what an Englishman is doing on the German radio tonight. You can imagine that before taking this step I hoped that someone better qualified than me would come forward. 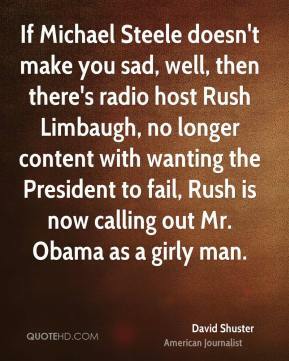 If Michael Steele doesn't make you sad, well, then there's radio host Rush Limbaugh, no longer content with wanting the President to fail, Rush is now calling out Mr. Obama as a girly man. 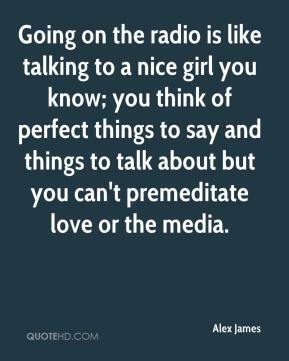 Going on the radio is like talking to a nice girl you know; you think of perfect things to say and things to talk about but you can't premeditate love or the media. I suppose, ... but that's why they get it wrong. 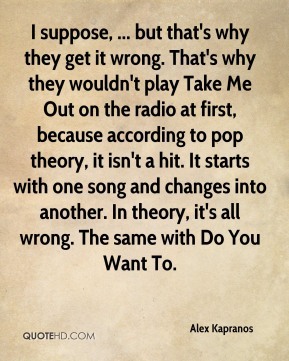 That's why they wouldn't play Take Me Out on the radio at first, because according to pop theory, it isn't a hit. It starts with one song and changes into another. In theory, it's all wrong. The same with Do You Want To. 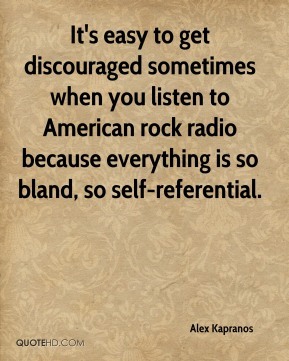 It's easy to get discouraged sometimes when you listen to American rock radio because everything is so bland, so self-referential. 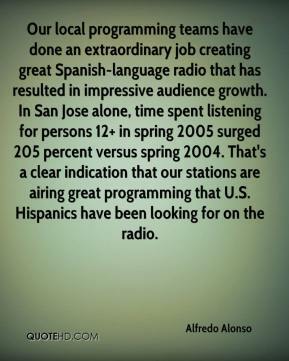 Our local programming teams have done an extraordinary job creating great Spanish-language radio that has resulted in impressive audience growth. In San Jose alone, time spent listening for persons 12+ in spring 2005 surged 205 percent versus spring 2004. That's a clear indication that our stations are airing great programming that U.S. Hispanics have been looking for on the radio. 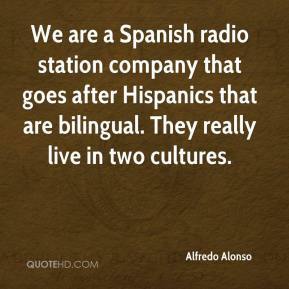 We are a Spanish radio station company that goes after Hispanics that are bilingual. They really live in two cultures. 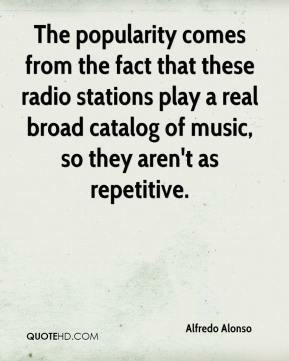 The popularity comes from the fact that these radio stations play a real broad catalog of music, so they aren't as repetitive. 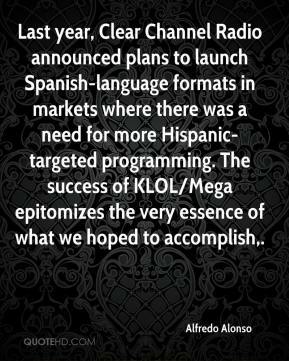 Last year, Clear Channel Radio announced plans to launch Spanish-language formats in markets where there was a need for more Hispanic-targeted programming. The success of KLOL/Mega epitomizes the very essence of what we hoped to accomplish. 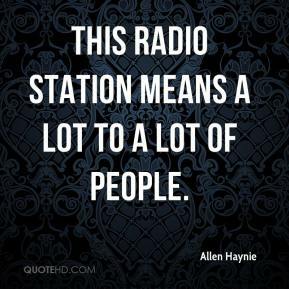 This radio station means a lot to a lot of people. It's not about conservative or liberal. 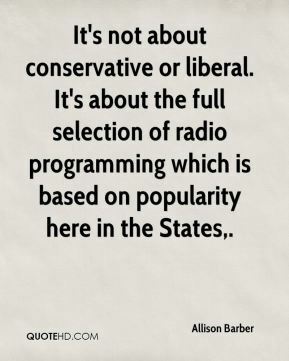 It's about the full selection of radio programming which is based on popularity here in the States. 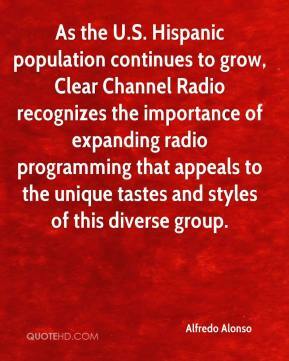 As the U.S. Hispanic population continues to grow, Clear Channel Radio recognizes the importance of expanding radio programming that appeals to the unique tastes and styles of this diverse group. 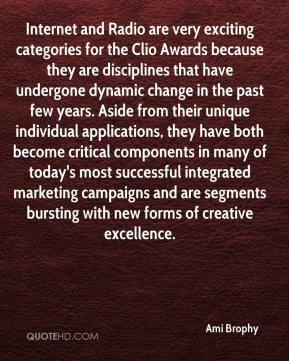 Internet and Radio are very exciting categories for the Clio Awards because they are disciplines that have undergone dynamic change in the past few years. Aside from their unique individual applications, they have both become critical components in many of today's most successful integrated marketing campaigns and are segments bursting with new forms of creative excellence. 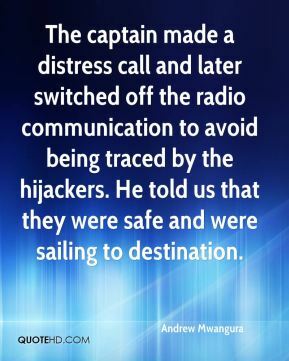 The captain made a distress call and later switched off the radio communication to avoid being traced by the hijackers. He told us that they were safe and were sailing to destination. Offline advertisers will no longer be content to be told that their radio ad will be heard by a potential audience size or demographic. Instead, they'll come to expect detailed reports and accountability. 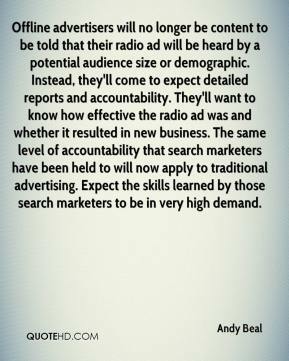 They'll want to know how effective the radio ad was and whether it resulted in new business. The same level of accountability that search marketers have been held to will now apply to traditional advertising. Expect the skills learned by those search marketers to be in very high demand. You could think of the TNF molecule, which sounds the alarm, as a very weak radio transmitter. It moves very slowly as it carries its warning message to neighboring cells, so it is unable to send that message over long distances. 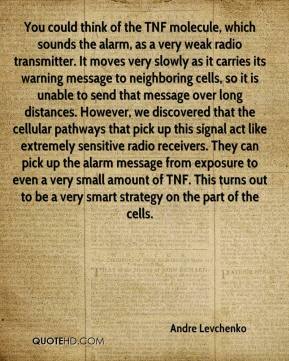 However, we discovered that the cellular pathways that pick up this signal act like extremely sensitive radio receivers. They can pick up the alarm message from exposure to even a very small amount of TNF. This turns out to be a very smart strategy on the part of the cells. 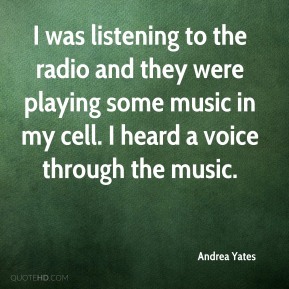 I was listening to the radio and they were playing some music in my cell. I heard a voice through the music. It's been a whirlwind. Everybody's been so supportive, especially here in the home base -- radio, press, fans, everybody. The feedback has just been tremendous. I use this phrase over and over, but it's been like a family reunion for me. This station has so much history to it. 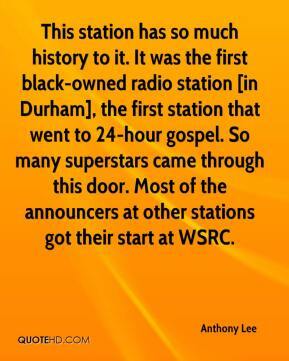 It was the first black-owned radio station [in Durham], the first station that went to 24-hour gospel. So many superstars came through this door. Most of the announcers at other stations got their start at WSRC. 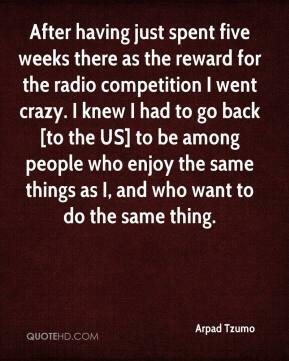 After having just spent five weeks there as the reward for the radio competition I went crazy. I knew I had to go back [to the US] to be among people who enjoy the same things as I, and who want to do the same thing. 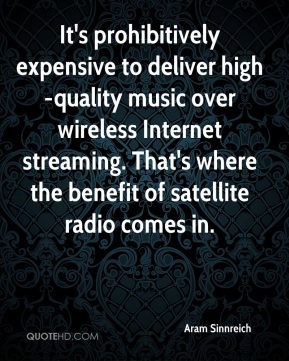 It's prohibitively expensive to deliver high-quality music over wireless Internet streaming. That's where the benefit of satellite radio comes in. 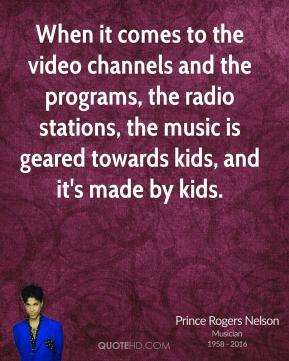 Radio was so important to everybody back then; there was no TV. 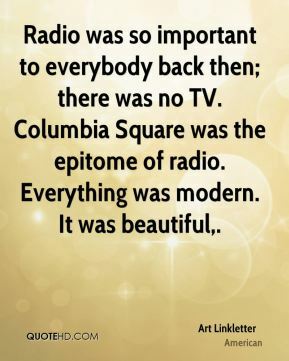 Columbia Square was the epitome of radio. Everything was modern. It was beautiful.